Packing for a Multi-Day Race: What to Bring and What to Leave Behind! In preparing for my move to Afghanistan, I had to whittle down all of my belongings for the upcoming year to two bags. I chose to fill the first bag with work clothes, head scarves and sandals. The second bag was dedicated to running clothes, head torches and running shoes. The hardest part was figuring out which of my fourteen prized pairs of shoes I could bring with me, and which ones I would have to leave behind. I narrowed it down to eight pairs, then five, and finally three. Okay fine, I added one more pair back into the pile, leaving me with four lucky pairs of running shoes that would get to tread on Afghan soil I hated to leave the others behind, but it had to be done – I simply didn’t have any more space. I was practically bringing more pairs of running shoes than underwear as it was already (er, almost). **Feel free to add some of your own ideas in the comment section below, especially those of you that are competing in RacingThePlanet’s 250 km self-supported race in Jordan starting this upcoming weekend! Usually in a multi-day, self-supported race like RacingThePlanet or Marathon des Sables, there are certain mandatory items that you will have to bring. This is NOT where you want to cut corners! They are mandatory for a reason. Not only are these items probably pretty important to have, but there may be serious penalties – including disqualification – if you fail to show that you are carrying them with you throughout the race. 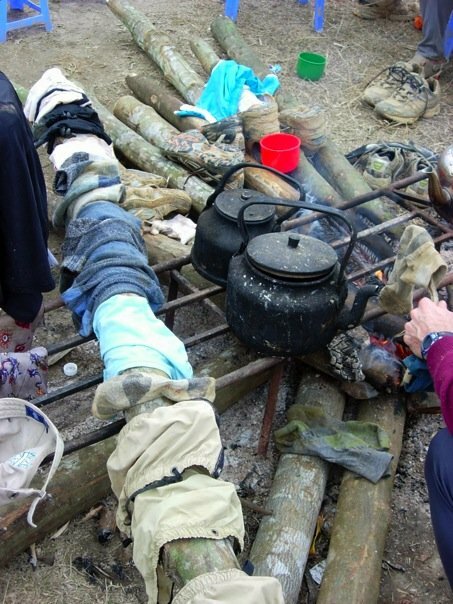 In RacingThePlanet Nepal in November 2011, I thought I had double-checked my mandatory equipment. Sleeping bag, check. Flashlight, check. Two pairs of socks, check… But when I unfurled the pairs of socks, it turned out that it was only three individual socks instead of four. Darn it! For the next six days of running, I had to rotate my three nasty socks from foot to foot to make sure that I didn’t wear any of them out too much. Sigh. Like I said, triple-check, okay? I guarantee that a lot of the items you think are ‘essential’ now, won’t seem like it after you carry them a couple hundred kilometers. Make a pile of all the things you think you can’t do without for the race. Then separate that pile into super essential and only moderately essential. You got it – leave the latter pile behind. This might seem like a ridiculous process, but trust me, you will be happy to get rid of the extra weight. For example, I often get asked how many pairs of underwear I take with me on a race. Underwear? Are you kidding me? No way. If I’m bringing shorts, they usually have built-in underwear and that’s good enough for me. And if I’m wearing compression tights, underwear is completely pointless. Shampoo, deodorant, soap? No, no and no. Leave it behind. You’ll survive. This is a race, not a beauty contest (er, or contest in hygiene… get comfortable with throwing that out the window…). Everyone else is going to stink to high heaven, so you might as well join the crowd. The better you smell, the more aware you will be of how badly other people smell, so save yourself the trouble! That being said, everyone is different, so really try to think about your own comfort level. I know a couple of gorgeous (and tough!) South African runners who wouldn’t dare go on a race without a little pink lip gloss and a compact mirror. Y’know what? Rock on ladies!! But for the purposes of this post, just know that what seems like a tiny item now can feel like a major burden later on. Gels/gu: these only have around a 2 or 2.5. While they might be good for marathons, they are REALLY heavy to bring in a self-supported race, so I usually only bring a couple caffeinated ones for a little pick-me-up during the long stage of the race. Not a weight-friendly source of calories! Potato chips (crisps for you English folk): these have around a 4.5 or 5, so they are a favourite race food of mine. Plus, they are a good source of carbs for energy as well as salt (don’t get the low-salt variety), which can help keep your salt levels in check during those hot desert races. Crush them up to save space and voila, you have a space-saving, weight-saving snack. Nuts: as one might guess, nuts are a really good source of high-calorie food. Macadamia nuts top the list at around a 5.5 or 6 calorie-to-gram ratio, while other nuts are around a 5. Just remember though that it is tough to really digest a lot of fat while you are on the go, so don’t really too, too heavily on nuts as a food source. Mix them with chocolate-covered raisins for a good fat + sugar boost. Pepperoni sticks: very calorie-dense – around a 5! And again, you’ll appreciate the salt. Yum. I usually take a dehydrated meal (such as Expedition Foods or Mountain House) for my breakfast and dinner, and then eat a bunch of little snacks throughout the day while I’m running. I then have a package of good ol’ ramen noodles for my post-run meal, which sometimes falls around lunchtime but sometimes doesn’t come until much later in the day! Ramen are a good race food because they are high-calorie (around a 4), you can crush the dry noodles up into a small, compact bag to save weight, and the high-salt content tastes REALLY good after a long run. In terms of snacks to eat on the go, I split my calories about 50/50 between my liquids and my solids. So that means that I get half of my calories through drinking (adding powders such as accelerade or perpetuem to my water) and half through eating. Everyone is different, but I find that this helps give me a steady flow of calories without making me feel sick. You don’t want too much food bouncing around in your stomach, but if you’re out running all day, you can’t survive on sugary juice alone (helloooo gut rot). Plus, the powders tend to be heavy…. Now, the food game is a tricky one. You are usually required to carry 2000 calories a day, which would be fine if you weren’t running a marathon over sand, dirt or mud. 2000 calories is woefully little, but it is difficult to bring much more. You WILL be in a calorie deficit the whole time. Bring additional calories above the 2000 mark depending on your size. Some like to live on the edge by bringing as little as possible and relying on the fact that others will drop out of the race and leave extra food behind. This is a tricky strategy that can seriously backfire (and technically you are violating the ‘self-supported’ rule, although I tend to think this strategy is all a part of the game… at your own risk…). This is a key one. Look at every item you have and get rid of any sort of wrapping or package that it came in. Take batteries out of the cardboard covering, take nuun tablets out of the plastic containers, advil or tylenol out of the plastic, dehyrated meals out of the foil, nuts/chips/chocolate out of the bags…. And put everything inside ziploc bags and cling wrap, which is much, much lighter. This WILL save you weight. Before my race in Australia, I weighed everything before and after replacing commercial packaging with ziploc bags. I was shocked to find that it made POUNDS of difference. I won’t go as far as snapping my toothbrush in half (okay, I did that once), but you get the idea. I am pretty keen on the treat bag. Yes, it is extra weight… but you are guaranteed to have at least one really low moment during the race where you will NEED a boost. This could be a good cup of tea, a piece of chocolate, a little ball of peanut butter (ah, my fav), photos from home, an ipod, or that pink lip gloss. Whatever. Just figure out what makes you feel better in your lowest moments and put it in that emergency bag. This is your little ziploc bag of non-food emergency items. Among other items you might think of, I always take with me a needle as well as duct tape. Why are these important? I’ll give you two real examples. 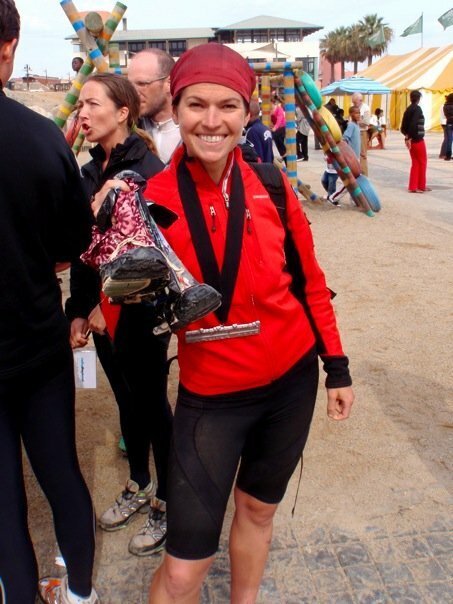 In my race in Namibia, I was wearing some fancy gaiters that I had bought from the States to help prevent sand from getting into my shoes and tearing up my feet. Well, little did I know that I would be running on some sharp rocks rather than soft sand on the first day. These gaiters lasted about an hour before the straps holding them onto my shoes broke and my shoes were filled with grating sand. Darn it. Well, with my trusty little needle and thread I took my two head buffs and sewed them over my shoes as a form of makeshift gaiters. They worked brilliantly!!! Without them, I definitely wouldn’t have been able to make it over those dunes. In Australia, the holder of one of my water bottles on my backpack broke right a couple of days into the race. With the help of my duct tape, I was able to hold everything together and carry on. I would have been really struggling without it! (Tip: make your own little roll of duct tape by wrapping it around a pencil to save space/weight). Okay, you’ve read the tips, you’ve packed your bag and you’re ready to go. You show up at the race thinking you are fully prepared. Then, you turn around and see someone with the tiniest, smallest bag you’ve ever seen. Panic ensues. You think, “what did I do wrong?? ?” The answer is, probably nothing. Sure, it is good to collect tips from other people on packing (like now! ), but it can be really stressful right before a race, especially if you can’t do anything about it. Try not to get too caught up in the pre-race panic. Some of those people with those super tiny bags – even if they are seasoned runners – are going to wind up seriously struggling in the race, and their packing style shouldn’t necessarily be followed. I’ve seen it happen. Just try to think about it logically before you throw away half your food and gear. So, this is just a start, but I hope these few ideas will get you on your way! I’m always picking up new ideas so please post your own comments/tips below. And gooooood luck to everyone this weekend in Jordan! Great tips. Sometimes experience is something you get right after you needed it the most! I just came back from RTP Jordan which was my 3rd 250km race, and what a race… (I did Australia with you as my first ever ultra, and what a lesson in acclimation prior to a race…:)) Injured my knee on the first day in Jordan, but made it to the finish line in 30th position, so indeed happy! My suggestion for a MUST have in you back pack is a Buff (or two), though not mandatory gear. They are “only” around 40 grams, but useful 40 grams. As you also write yourself, a Buff can be used for may things during a race, such a improvised gaiters. While we were in camp 4 during the Jordan race, we had a sand storm and my Buff “saved” me. I used it to cover my face while sleeping, not to wake up with my mouth, nose and eyes covered in sand. They also work as a good cooling device, e.g. when soaked and left under your cap and will protect you against the sun, especially on the long stage, when you are out in the sun for hours! Have a great day and hope you work will make a difference. Thanms for taking the time to share your advice! im doing a,500km race so need all the info i can get. WOW!!! What 500km race are you doing? Would love to hear more! 9 stages with the last stage a single 127 km one! More afraid of blisters than anything else!! Ah, the track! I know it! If you have time, order some chafex – it’s good for reducing blisters and chafing. Necessary for the outback! Email me and I can wrangle you a discount 🙂 🙂 Stephanie.a.case@gmail.com.